Every week on Facebook, Twitter and Instagram the LSU School of Veterinary Medicine highlights someone at the LSU SVM, whether they are faculty, staff, student, alum, house officer, graduate students or some times even a patient. These features give social media followers a chance to get to know the personalities, achievements and interesting facts about amazing people that come to the LSU SVM every day. To stay up-to-date on the Wednesday's Who's Who features, follow us on Facebook, Twitter and Instagram. Wednesday's Who's Who is Clayton Forbes, Director of Development for the LSU SVM. Clayton is a lifetime resident of Baton Rouge and received a degree in mass communications/public relations from LSU. Some of his job responsibilities include helping grateful clients, alumni, and others fulfill their passion by raising private funds to support the school and its mission. Clayton says his favorite thing about working at the LSU SVM is that it doesn’t feel like work at all. “I love the people on my team and everyone at the school. This is my dream job!” Something most people don’t know about Clayton is that he knows most 80’s TV theme songs lyrics and likes singing them any where at any time. Wednesday's Who's Who is the first foal born at the LSU SVM for 2018. While he has not been named yet, his mother is Ghost on the Run, sired by Point of Entry. He was bred in Kentucky and was born on January 31, 2018. According to Dr. Jenny Sones, assistant professor of Theriogenology at the LSU SVM, it only took the colt one hour to learn to stand on his own. He now lives in St. Gabriel Parish with his mother. He enjoys feeding from his mother and is already very playful, bucking and kicking in the pasture at home. Wednesday's Who's Who is Celia Ordoyne, outreach coordinator for the LSU SVM. Celia is the person behind successfully planning the Open House event hosted on January 20, as well as continuing education workshops and other events at the LSU SVM. She is originally from Thibodaux and attended Nicholls State University where she received a degree in marketing. Her favorite part of her job is getting to work in a collaborative environment and working with students, faculty members, staff, as well as organizations within the Baton Rouge community, who all share the common goal of promoting the LSU SVM. Something most people do not know about Celia is that she has a bouncy-ball collection from all the places she has traveled, including the many college campuses she traveled to while previously working as a chapter consultant for Phi Mu Fraternity. Wednesday's Who's Who is Dr. Yogesh Saini, assistant professor and researcher in the Department of Comparative Biomedical Sciences at the LSU SVM. Dr. Saini is originally from Himachal Pradesh, a hill state on Himalaya in Northern India. He received his BVSc and MS, both from universities in India, and his PhD from Michigan State University. 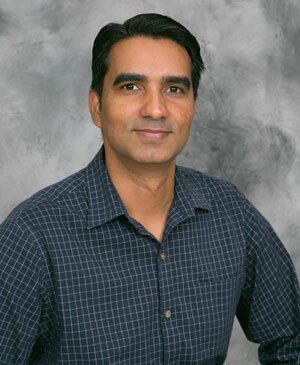 Dr. Saini’s job responsibilities include researching and teaching respiratory physiology to first-year vet students. His research focuses on the area of lung diseases, such as asthma, COPD, and Cystic Fibrosis. His favorite part about working at the LSU SVM is that, although most of his research is in human diseases, having the opportunity to teach future DVM professionals allows him to stay connected to his veterinary education roots. One thing most people do not know about Dr. Saini is that he loves to sing and play cricket. Wednesday's Who's Who is Juliana Meyers, coordinator in the LSU SVM Business Office. While you might not see the business office staff often, these employees are an integral part of keeping the LSU SVM up and running smoothly. Some of her job responsibilities include being the cost center manager for the Public Relations, Student Affairs, Library, Continuing Education, Computer Services and Advancement departments (AKA she handles the expenses). Even though she is originally from Baton Rouge, Juliana is a proud alum from Auburn University. Guess we can forgive her since she says she loves spending Saturday nights in Death Valley enjoying the games with her husband, Stephen.